I’ve been involved in a learning experiment these past six weeks. Now that it’s winding down, I thought I’d reflect a bit on some themes that emerged. For the past 9 months or so, I’ve been taking classes online from Coursera to complete a Cybersecurity specialization taught by the University of Maryland. I’ve learned about security and usability, various flavors of software vulnerability, secure integrated circuit design, digital watermarks, and encryption theory. In early May I began the final class in the sequence–a capstone project where teams of students attempt to build secure software to match a spec, then try to break one another’s submissions with a combination of pen testing, static code analysis, fuzzers, and theory taught in our other security courses. The project is framed as an international coding/testing competition hosted on builditbreakit.org (hence the “bibifi” in the title of this post), and this May’s running of the contest includes several hundred very sharp participants from around the world. Partial bibifi scoreboard, showing 5 of about 100 teams. I was on team “SEADA”. 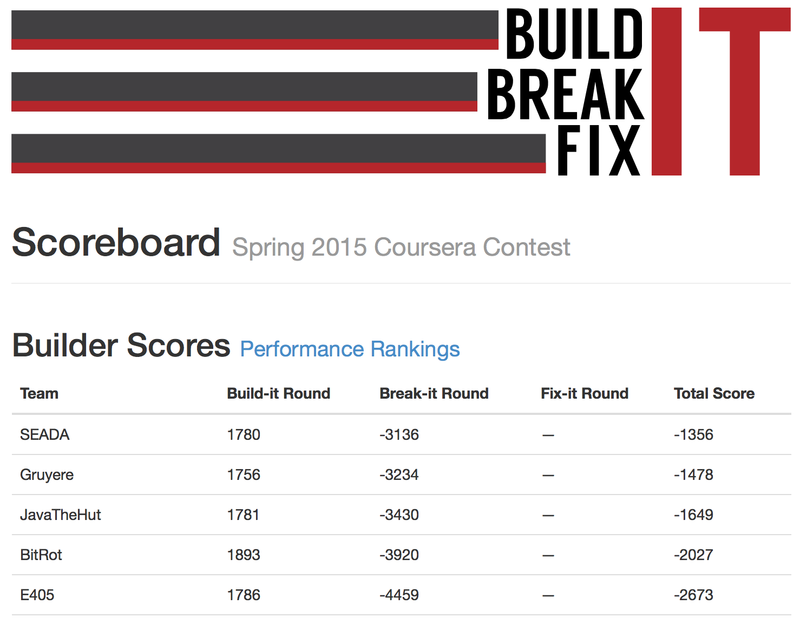 Net of score in buildit round minus bugs logged against code in breakit round shows current overall standings.